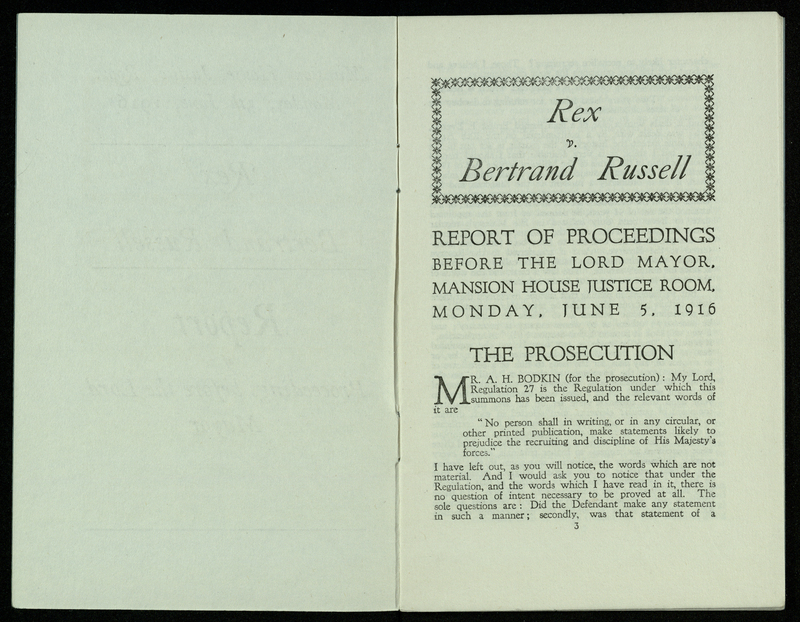 A pamphlet containing the proceedings of Bertrand Russell’s trial. Despite the widespread patriotic support for the Great War, there were many people in Britain who opposed it for moral, economic or political reasons. Some conscientious objectors (COs) were happy to aid the war effort in non-combatant capacities, while others refused to do any work that would contribute to the war effort. Despite being labelled as “cowards” and “peace cranks”, these individuals risked isolation, abuse and arrest. For some COs, the record of having been to prison for being a conscientious objector followed them for the rest of their lives, keeping them from steady employment. A few COs even died in prison. For many COs, the moral stance against war derived from religion. First page of the pamphlet containing Russell’s trial in 1916. 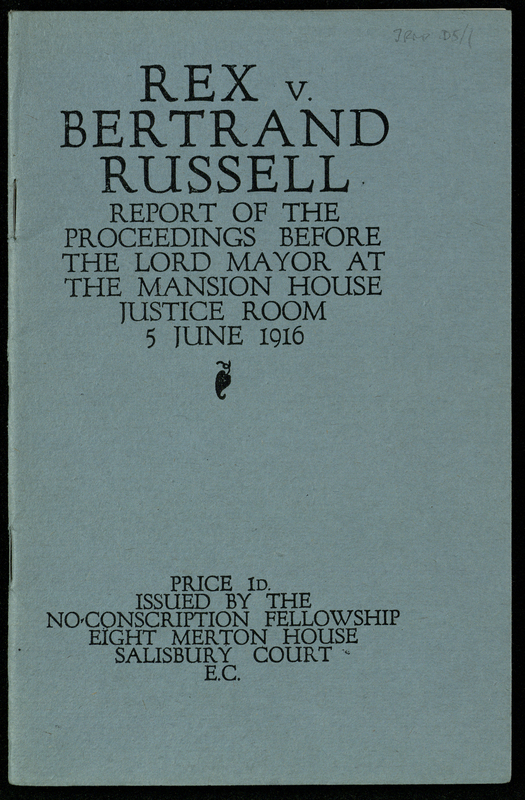 Russell and others openly opposed the war from the beginning, and in 1916, with the introduction of Conscription, he authored a pamphlet distributed by the No Conscription Fellowship speaking out against the law and the ways in which it was enforced. After six men were arrested and sentenced to prison and varying degrees of hard labour for distributing the pamphlet, Russell wrote a letter to The Times confirming his authorship and stating that, “If anyone is to be prosecuted I am the person primarily responsible.” He subsequently sentenced to prison under the Defence of the Realm Act and fined £100. The proceedings of that trial were published as the pamphlet displayed here. This conviction led to Russell’s dismissal from his lectureship at Trinity. Later, he spent nine months in Brixton prison for his outspoken pacifism. 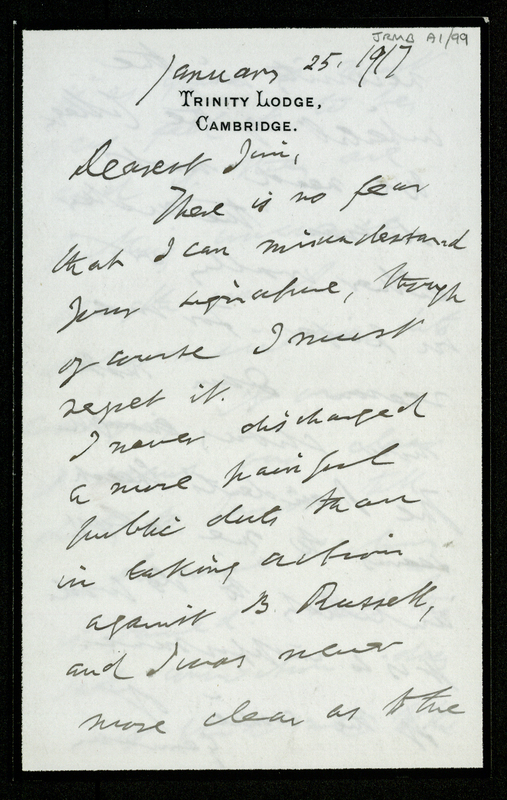 The first page of a letter from H.M. Butler to J.R.M. Butler about the dismissal of Bertrand Russell from Trinity. H.M. Butler wrote to his son, “I never discharged a more painful public duty than in taking action against B. Russell, and I was never more clear as to the necessity in the interest of the college.” This was not a universally approved action and several fellows wrote to the college Council to criticize Russell’s dismissal. He was reinstated as a member of Trinity in 1919 and made a Fellow of the College in 1944. 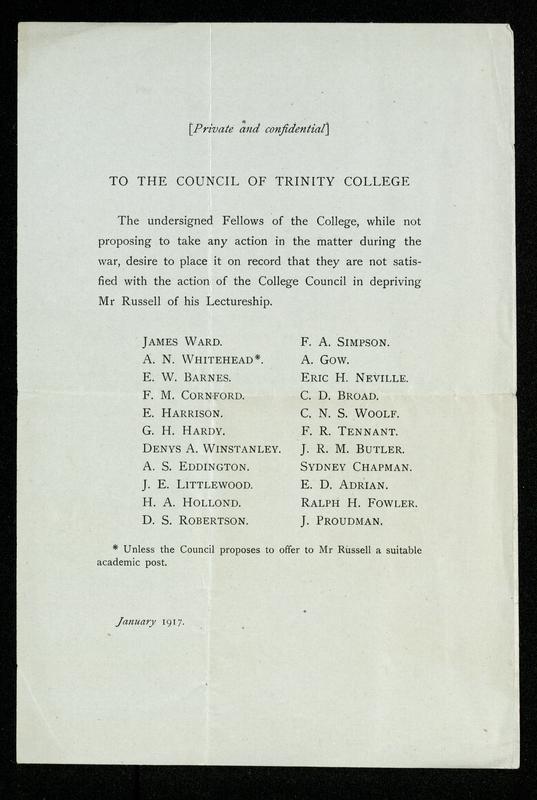 A letter to the college Council from several fellows registering their disapproval of Russell’s dismissal. Blackburn, Simon (2014) “Russell, Wittgenstein, and the First World War”. The Fountain, 18. The Cambridge Review. 10 February, 1915. Clemens, Kate (2013) “Conscientious Objection“, First World War Centenary, Imperial War Museum. See also our interactive timeline of World War I for a look at some of the events that shaped Trinity’s wartime experience.